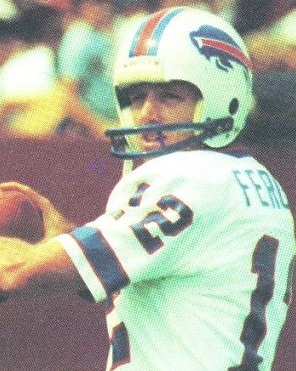 Ferguson passed for 4431 yards and 24 touchdowns in college and was chosen by the Bills in the third round of the 1973 NFL draft. He beat out veteran Dennis Shaw and started every game as a rookie, rarely throwing in a conservative offense that was geared around the running of record-setting HB O.J. Simpson. Ferguson went to the air only 164 times, completing 44.5 percent for 939 yards and four touchdowns against 10 interceptions. The team went 9-5 and did so again in ’74 as Ferguson showed much improvement, passing for 1588 yards and 12 touchdowns with as many interceptions. Bills went 8-6 to finish third in the AFC East while leading the NFL in rushing yards (2974), total yards (5467), touchdowns (57), and scoring (420 points). Ferguson missed half of the 1976 season due to injury but returned to pass for a league-leading 2803 yards in ’77, although also topping the NFL with 24 interceptions with a 3-11 team. He went on to display impressive durability thereafter despite a smallish build and didn’t miss another game until 1984, his last year with Buffalo. Ferguson guided the offense during playoff seasons in 1980 and ’81, completing 57.2 percent of his passes for 2805 yards and 20 TDs in ’80 and a career-high 3652 yards with 24 touchdowns in 1981. With the team in the doldrums, he was traded to Detroit following the ’84 season and ended his career with stints as a backup with the Lions, Buccaneers, and Colts. Overall, Ferguson threw for 29,817 yards and 196 touchdowns, and held many Buffalo career passing records at the time of his departure (and which to date still rank second only to Jim Kelly), including completions (2188), yards (27,590), and TD passes (181).